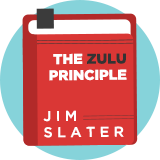 Jim Slater Zulu Principle is a growth investing strategy inspired by UK investor Jim Slater in his book, The Zulu Principle. The strategy combines growth, value, quality and momentum factors. Its most famous ratio is the price-earnings-growth factor (PEG) which compares a company's forecast price-to-earnings ratio with its forecast earnings-per-share growth rate. It also looks for a high return on capital employed and positive relative price strength in small and mid-cap shares. Jim Slater wrote: "Most leading brokers cannot spare the time and money to research smaller stocks. You are therefore more likely to find a bargain in this relatively under-exploited area of the stock market." Jim Slater's son Mark Slater uses Zulu Principle-inspired rules at his MFM Slater Growth Fund, which achieved a total return of 61% over the three years to November 2014. Jim Slater is one of the UK's most popular home-grown investors and his strategy is well followed. Famous UK investment guru who specialises in growth investing. Author of the 'Zulu Principle'. According to Company REFS, Irish stockbrokers Merrion back-tested a Zulu Principle portfolio of stocks and concluded that it would have delivered an almost 10 year CAGR of 24.5% (excl. costs), compared to just 4.4% CAGR for the FTSE All Share.